NLÉ projects are worth writing about! They have received attention from around the globe and have been covered by many leading press and media. Read the full stories below to find out more. For all press requests please email contact@nleworks.com. NLÉ’s masterplan sees the school program divided into three clusters: the ‘live island’, where comfortable dormitories with common lounge areas are oriented to face the rising sun; the ‘learn island’, which comprises classroom blocks and a school hall situated in a grid on the sloping landscape; and the ‘play island’, which will include a sports field located on the only flat part of the site. the clusters are interconnected by a pathway, which establishes a safe yet open environment protected from and yet within the wildlife. Set Alongside a Lush Crater, Kunlé Adeyemi’s New School Plants Deep Roots in Tanzania. Adeyemi and his team from NLÉ draw from the verdant local landscape and age-old building traditions for the design of the Black Rhino Academy. The medieval city of Bruges is known for its canals, but now the Belgian city’s connection to water is being explored in a whole new way. Al 70.000 bezoekers voor drijvende school. We gaan samen met fotograaf Iwan Baan naar de Floating School in Brugge, een onderdeel van de Triënnale dit jaar. De fotograaf kent de architect van het kunstwerk en vertelt ons meer over het concept. MFS III – Minne Floating School is de derde versie van de drijvende school. Ze dient als prototype van een constructie die voldoet aan onze fysieke en sociale behoeften in het licht van de almaar groeiende uitdagingen waarvoor de klimaatverandering ons stelt. Meet the Nigerian Architect Who Built a Transformative Arts Center in the Middle of NYC. 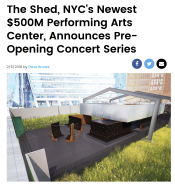 The city is a year away from the opening of the Shed, a multipurpose arts-and-entertainment space currently under construction where the High Line and Hudson Yards meet. Prelude to the Shed’s free art fortnight is a utopian breath of fresh air. The Shed Hosts Pre-Opening Event at an Off-Site Location in Manhattan The 12-day event opens May 1 at 10th Avenue and West 30th St., one block from where the Shed will stand. Before it officially opens in spring 2019, The Shed, a new multi-disciplinary cultural centre under construction on the far west side of Manhattan, will host a 12-day arts festival this May. Water and the City is a comprehensive publication documenting parts of the ongoing research project African Water Cities, a unique and innovative body of work initiated by architect, designer, and urbanist Kunlé Adeyemi, in 2011. In choosing this year’s theme, Alejandro Aravena shone a spotlight on unsung heroes, peripheral communities and no-frills architecture, showing a widening gap between big-name starchitects and emerging, socially-minded practices. Deze week zijn in Londen het Serpentine Pavilion en vier Summer Houses geopend voor het publiek. Het paviljoen, de zestiende in de serie, is ontworpen door BIG. Het Nederlands-Nigeriaanse bureau Kunlé Adeyemi – NLÉ ontwierp een van de geabstraheerde zomerhuisjes. 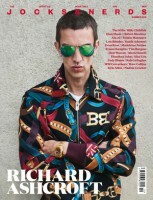 Jocks&Nerds is a quarterly men’s style magazine founded in 2010. It is recognised for its documentary style photography and journalistic integrity, claiming a roster of well-respected cultural writers, stylists and photographers amongst its staff and contributors. 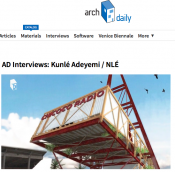 Kunlé Adeyemi was interviewed for their Lagos special issue. Venice Architecture Biennale 2016: Nigerian architect Kunlé Adeyemi has been awarded the Silver Lion for bringing his floating school to the Venice Biennale, as part of his ongoing research into building for flood-prone regions. CCTV Africa visit Makoko Floating School to speak to the headmaster Noah Shemede and his students about their experiences since attending class there. Instead of simply building flood defences, designers are beginning to create structures and buildings that embrace water. An aid-funded floating school is a beacon of hope for the Makoko fishing community in Nigeria. In a village stricken with poverty, the Makoko Floating School in Lagos serves as an educational model of how to build prosperous communities on the water. Climate change, urbanization and floodings: the aquatic city of Makoko, Nigeria. Earlier this month, news of the expanded Serpentine Pavilion sent ripples of excitement through the capital, and now we’ve been granted a first look at the main pavilion and accompanying four Summer Houses taking shape this summer. 7 Architects Bridging Cultures “Doing architecture is listening.” Some of the greatest architects of our time – from Peter Zumthor to Jean Nouvel and Diébédo Francis Kéré – here share their inspirational thoughts on what it is that makes global architecture work. A floating school is giving the children of a fishing community in Makoko in Lagos, Nigeria, the chance of a better life. The BBC’s Martin Patience went to speak to some of the pupils about their aspirations. When architect Kunlé Adeyemi designed a floating school in Lagos, Nigeria – which captured global attention – it was a sort of homecoming for him. He began life near water, nearly 800km north of Lagos in Kaduna, which means crocodile in the Hausa language, as the river running through his home city was indeed dotted with lounging reptiles. They are buildings in which to teach and learn – but they can be magnificent too. Jonathan Glancey discusses some of the most stunning seats of learning. A major new prize aimed to discover the best new buildings from around the globe is being unveiled today (8 December) by the RIBA, and proudly partnered with Wallpaper*. The 2016 RIBA International Prize will honour a building which exemplifies design excellence and architectural ambition, and delivers meaningful social impact. On the prestigious judging panel, chaired by Richard Rogers, is Nigerian-born Kunle Adeyemi, an inspiring young architect, whose firm NLÉ is based in Amsterdam. From Frank O. Gehry’s shining Louis Vuitton Foundation in Paris to Zaha Hadid’s curving Heydar Aliyev Center in Baku, take a global tour through the architectural practice emerging today, and defining tomorrow. 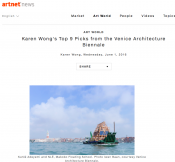 The best-selling series of Architecture Now! celebrates its tenth edition with more than 70 international projects arranged in a neat new format. occurring at the inaugural chicago architecture biennial, architecture, design and urbanism practice NLÉ, led by kunlé adeyemi has created ‘rock & the bean’- an installation sited right at the heart of the city’s renowned millennium park. working with the school of the art institute of chicaco (SAIC), the installation is connected to SAIC and NLÉ’s co-creation of the chicago lakefront kiosk ‘ROCK’. Big limestone blocks currently displayed in Millennium Park near the Bean will be reassembled at Montrose Beach as part of a dramatic concrete-and-stone kiosk called “Rock” that will project out over the lakefront. It’s from the School of the Art Institute and Nigerian-born architect, who is based in Lagos and Amsterdam. With its Lakefront Kiosk competition, the Chicago Architecture Biennial is hoping to leave a long-lasting impact and legacy for its city. The ROCK, a submission from NLÉ Architects in collaboration with School of the Art Institute of Chicago, is giving the public the opportunity to shape that legacy. Throughout the course of the event, which opened on October 3rd, eventgoers are invited to Millennium Park to add value to the 1930s limestone rocks that will create the pavilion through carving, painting, performances and other unimagined processes. The final lakefront kiosk, titled “Rock” and designed by Nigerian architect Kunle Adeyemi in association with the School of the Art Institute of Chicago, has unmistakable echoes of Frank Lloyd Wright’s famous Fallingwater house. Among them is a platform that will cantilever over protective rock walls at Lincoln Park’s Montrose Beach. NLÉ is founded in 2010 by Kunlé Adeyemi and based in Lagos and Amsterdam. They are quickly fulfilling their mission to shape the physical, human, cultural and economic architectures of developing cities. With several remarkable projects such as ‘ROCK – Chicago Lakefront Kiosk’ – you can read more about this below, as wel as the corresponding exhibition ‘Rock & The Bean’ – we thought it was time for a spotlight on this notable agency. Mayor Rahm Emanuel made the announcement at the Cultural Center, 78 E. Washington Blvd., which will serve as focal point of the exposition, technically running from Saturday through Jan. 3. Michelle T. Boone, commissioner of the Department of Cultural Affairs and Special Events, called it a “global exposition of contemporary architecture.” It showcases the work of more than 100 architects from more than 30 countries. So your city is about to double in size, and it’s happening whether you like it or not. Infrastructure will be strained, sanitation is a concern and children need educating. For Lagos, this is the question on many experts’ lips; a headache already 17.9 million people large and due to increase twofold by 2050 according to some predictions. 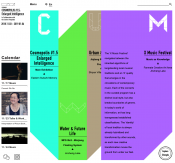 FUTURE LAGOS | Part 2: Resilient Cities; are we ready to live on water? In Africa, Lagos is not the only coastal city that is vulnerable to rising seas, there are at least 20 cities, including Cairo, Egypt; Cape Town, South Africa; and Kinshasa, Democratic Republic of the Congo. With man’s constant struggle to live with water, Nlé, a collaborative architectural practice with a focus on developing cities, is changing the discourse through The African Water Cities project. The project is a research and documentation project that focuses on adapting coastal cities to the impact of urbanisation, resource shortages and climate change. To date the project has moved away from just research and documentation to also architectural forms. These have been realised in the award winning Makoko Floating School in Lagos, Nigeria and more recently the Chicoco Radio in Port Harcourt, Nigeria and the Chicago Lakefront Kiosk, USA. SAIC has teamed up with Nigerian architect Kunlé Adeyemi, who joined the school as a visiting faculty member in summer 2015. Adeyemi is a leading researcher of the growth of urban communities in developing countries and owner of urban design firm NLÉ in Amsterdam. He will lecture as part of SAIC’s Visiting Artists Program on October 5. The 2015 NZIA conference in:situ in February brought together a stellar line-up of international architects and academics who shared their projects and experiences of working in the architectural profession in different parts of the world. Born in Nigeria but working from Amsterdam, Kunlé Adeyemi of NLÉ Works has landed himself in the media spotlight with his design for a floating school in an impoverished area of Lagos, which inspires alternatives to the invasive culture of land reclamation. He spoke with Justine Harvey of Architecture New Zealand during the conference. When Jessica Collins and photographer Iwan Baan visited Lagos in 2013 to document a radical new school, the Makoko slum was facing demolition. Now the building’s global recognition is helping to give the community fresh hope. The chicago architecture biennial reveals four lakefront kiosk designs. In the grand sweep of Chicago’s lakefront, a little kiosk may not seem like much. But Mayor Rahm Emanuel and the organizers of the upcoming Chicago Architecture Biennial can cite a telling counterexample: the Lincoln Park Chess Pavilion, where chess players match wits on boards beneath a winglike concrete overhang. The 1957 pavilion, which sits east of Lake Shore Drive near North Avenue, is at once a sculptural object, an orienting device and a lively people place. As part of our special focus on innovation in Africa, we have developed a list of 40 remarkable African innovators. Actually, it’s more like 47 but we counted teams as one. 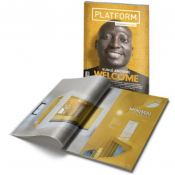 Our decision to celebrate these idea creators and solution providers stems from our belief that the true wealth of Africa is not buried under its soil, but in the brains of its best minds. This list is a testament to that belief. It comprises Africans from every part of the continent, across diverse fields. We have brought them together because of the impact and potential of their ideas and processes in transforming the continent. A 60-strong list of international studios has named the official participants of the first-ever Chicago Architecture Biennial – the “largest international survey of contemporary architecture in North America.” Chosen by Biennial Co-Artistic Directors Joseph Grima and Sarah Herda – who are supported by an advisory council comprising David Adjaye, Elizabeth Diller, Jeanne Gang, Frank Gehry, Sylvia Lavin, Hans Ulrich Obrist, Peter Palumbo, and Stanley Tigerman – each participating practice will convene in Chicago to discuss “The State of the Art of Architecture” and showcase their work from October 3 to January 3, 2016. 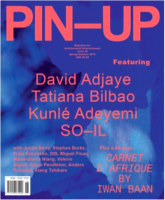 PIN–UP is a biannual English language architecture and design magazine based in New York. It was founded in 2006 by architect and writer Felix Burrichter. About 15,000 people live permanently afloat on canals, rivers and coasts in Great Britain alone, but thousands more enjoy holidaying on boats or own them as weekend retreats in the UK and abroad. This book will feature not only static residential boats and floating dwellings but also those used as holiday homes and funky modern businesses – houseboats can range from canal boats, riverboats, narrow and wide beam boats, barges, Dutch barges, static houseboats and even seaworthy cruisers moored in marina. The book will cover stylish boats from the UK, North America, Europe and Australia. The houseboats engage the reader through their history and owners’ stories, which are told in lively text and colourful images. People fall in love with boats and own them for a variety of reasons: out of affordability and necessity; a love of the water; closeness to nature and the environment; or just because they yearn for a different and more relaxed style of living/working space. This book shows how houseboats can offer an attractive, practical and alternative solution, as well as amazing and often idiosyncratic solutions to living successfully in a small space. My cool houseboat covers the following themes: stylish architectural, from San Francisco to Prague; thrifty and eclectic, as an affordable solution to conventional city dwelling; businesses, using houseboats as unusual workspaces, from a book barge to an allotment; modernist, from a Finnish floating office to an Amsterdam watervilla; recycled, ranging from an Ellis Island ferry houseboat to a converted minesweeper; and soulful, covering alternative ways of life, relaxation and recreation, from a New York City houseboat to a stylish Paris home. The inaugural Chicago Architecture Biennial announced the list of participants and artists that who will participate in the “largest international survey of contemporary architecture in North America” this fall from October 3 to January 3, 2016. The temptation to talk about an African architecture is great, but it is, of course, ridiculous. There is no such thing and never was. Africa’s architecture is infinitely, thrillingly diverse and its variety embraces everything from the modernist ambition of postcolonial visionaries to the invention of the ad hoc informal settlements around some of the world’s most dynamic and fast-growing cities. PANAJI: The concept of floating buildings is not a novel one. But what if a 420 sq m structure of 3 floors could be built on water with locally available material and the manpower of only eight individuals? This new and innovative form of an urban structure was materialised by Nigerian architect, designer and ‘urbanist’, Kunle Adeyemi. Saturday afternoon saw some massive intellectual stimulation as Adeyemi shared his ground-breaking project on floating structures in his discourse on ‘Great city, terrible place’, at the latest edition of the Z-Axis annual conference being held at the Kala Academy, Panaji. Adeyemi developed the Makoko floating school as a prototype for construction in the coastal region of Makoko, a place which has regular floods due to unpredictable water levels. ‘Why the Chicago Architecture Biennial’s Kiosks Will Be CHI-IL As Heck.’ With the its local scene gaining momentum, the Chicago Architecture Biennial is threatening to steal some of the Venice Biennale’s thunder. (Please don’t give me concrete shoes!) One of the most exciting things in Chicago — and part of what is fueling the momentum of the Biennial — is the schools there. They have a complex history, as the skyscraper was born in Chicago, and Mies and Tigerman famously had a productive back-and-forth for many years at IIT and UIC respectively. Today, Chicago’s schools are thriving under strong leadership that has attracted some of the top design talent in the United States and the world. International design firm NLÉ has recently shared its competition-winning design for the financial headquarters of the microfinance bank Credit Direct Limited. Located in Lagos, Nigeria, in the Ikeja district, the bank’s design abandons the forbidding presence of most financial institutions for one that is open and welcoming. This decision not only invites clientele inside, but creates opportunities for adaptation to the tropical weather of Lagos. By the year 2100 there will be 11 billion people on our planet. Architect David Adjaye introduces us to two up-and-coming names building for the future. Just inside the entrance to the MoMA exhibition, Uneven Growth: Tactical Urbanisms for Expanding Megacities, a video shows men yanking wooden frames out of brick walls and hammering materials into place, providing a glimpse into the ‘tool-houses’ of Mumbai’s urban settlements that mix live-work functions. A passing viewer commented to his companion while shaking his head, “Look at that, they have to build everything by hand. Can you imagine how much work that takes?” This visceral response—a mixture of marvel and estrangement—encapsulates the conundrum of an exhibit showcasing tactical urbanism scenarios in six global cities. Who exactly does the work of tactical urbanism? And what can the architect or designer accomplish in these constantly shifting urban milieus? The Chicoco Radio Station designed by Lagos and Amsterdam-based studio NLÉ will empower the nearly 480,000 people living on the waterfront of Port Harcourt in Nigeria with a community media platform. Considered a ‘bridge to transformation’ the steel structure is at one end raised off the ground supported by the towering radio antenna, while at the other end floating on the water’s surface as an aquatic jetty and stage. The linear projection is created with large trusses connected by an expansive floor plate. At the water’s edge, a large movie screen faces both the people sitting on the inclined floor as well as the boats around the exterior. Megacities like Rio or Mumbai grow fast – usually at the expense of the poor while the rich benefit . But there is another way . The cities of the future might look different. People are moving into cities at an astounding rate — so fast, not even the cities themselves will be able to keep up. A new show at the Museum of Modern Art opens this week to examine how that explosive growth will affect six cities globally: Hong Kong, Istanbul, Lagos, Mumbai, Rio de Janeiro, and New York City. The statistics are staggering: Researchers predict that by 2025, the world will have 37 megacities, defined as urban areas with more than 10 million people. New York City and Newark are expected to have more than 23 million inhabitants; Tokyo, more than 38 million people. All told, well over half of the world’s population will be living in these super settlements. 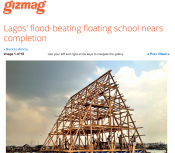 When the Makoko Floating School was completed in March 2013, it received wildly enthusiastic critical acclaim from the international news media. The simple A-frame structure, buoyed by recycled plastic barrels in a lagoon in Lagos, Nigeria, was designed by NLÉ, a Lagos- and Amsterdam-based studio founded by the architect Kunlé Adeyemi. The twelve winning projects of the Holcim Awards 2014 Africa Middle East focus mainly on enhancing social and environmental resilience, as well as the economy of construction. 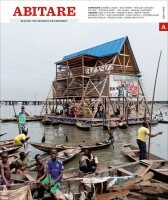 Makoko Floating School featured in OmVärlden – a Swedish magazine about development and global issues, pp. 10-11. … The idea that urban planning could build upon citizen action, rather than consisting of imposed boulevards or housing blocks (as with the urban renewal that originally gutted Roxbury) is gaining traction. The Museum of Modern Art, which has exhibited its fair share of top-down architectural proposals, amplifies that conversation with “Uneven Growth: Tactical Urbanisms for Expanding Megacities” opening Nov. 22. Makoko Floating School was featured in A+U magazine from Japan, which tackles a diverse range of themes, movements and discussions in the fields of architecture and urbanism. Makoko Floating School was featured in the Taiwanese magazine Deco, p. 46. Makoko Floating School featured in the Austrial weekly news magazine published in German, p. 62. Our floating school featured in Kulturaustausch – a German journal for international perspectives, p. 70-71. In the waterside slums of Port Harcourt, Nigeria, 480,000 residents face the threat of displacement as the government seeks to redevelop their land, claiming urban renewal is necessary for economic development. But Kunlé Adeyemi has an alternative solution. He envisages a city of floating homes that would allow residents to remain within their community, and safe from rising tides, while at the same time improving the quality of their lives. “Ripple Effect: Education and the next generation” is the theme of TEDxEuston Salon 2014. We have put together another set of amazing speakers that will challenge you in different ways! CNN) — Africa is a land under construction. 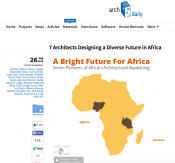 Last year, over $220 billion was spent on all kinds of building projects in the continent. While foreign architects have clamored to make their mark in the region, a range of local talent has also stepped forward to shape their landscape (and in some cases, export their aesthetic abroad). The latest episode of Al Jazeera’s Rebel Architecture takes us to Nigeria, where architect Kunlé Adeyemi has designed floating buildings to help solve overcrowding and flooding in the country’s waterside slums. “I am constantly inspired by solutions we discover in everyday life in the world’s developing cities,” he says. Yet, despite his studio NLÉ’s easy-to-build, low-cost, sustainable prototype for a floating building, Adeyemi still struggles to get approval for their construction from the local authorities. This 25-minute episode follows Adeyemi as he seeks to implement his floating buildings. NLÉ with Makoko Floating School was mentioned in a Turkish magazine for kids, p. 7! The Design Museum in London has announced 76 nominations for Designs of the Year 2014, including a floating school in a Nigerian lagoon. 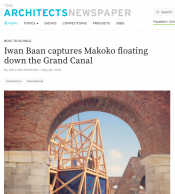 Makoko Floating School was featured in ICON, one of the world’s leading architecture and design magazines from the UK, as one of the most socially responsible designs of the year! Makoko Floating School was featured in the Afritecture section of the German magazine Aface together with other recent school projects in Africa, p. 22. Makoko Floating School was featured in the Swedish magazine Ingenjören, a publication for the national Swedish Engineers Association, p. 20. Buoyed by recycled barrels, a structure in a fishing village next to Lagos, Nigeria has just been nominated for a Design of the Year Award. Makoko is a slum on the waterfront of Lagos, Nigeria; tens of thousands of people live in the fishing village on stilts. With support from the UN Development Fund, Nigerian architect Kunlé Adeyemi has designed a school that floats on 256 recycled plastic barrels. 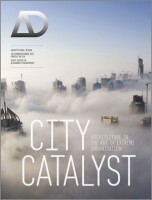 Makoko Floating School was featured in the German magazine Architektur, p. 27. 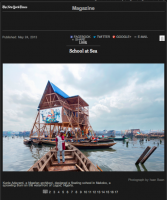 Makoko Floating School featured in Arqa – Portuguese Contemporary Architecture and Art Magazine, pp. 100-105. NLÉ and the floating school were featured in the Travelling Exhibitions Catalogue by Vitra Design Museum as a part of the chapter called “Making Africa. A Continent of Contemporary Design”. 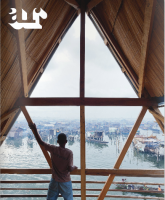 We are delighted to share with you ‘The Japan Architect’ Magazine’s World Yearbook 2013 feature on NLÉ’s Makoko Floating School. é Adeyemi will be exploring the 2014 World Design Capital Theme: Live Design, Transform Life, as part of the South African Institute of Architect’s AZA2013 international workshop in Cape Town. NLÉ is one of six interdisciplinary teams involved in MoMA’s Uneven Growth initiative, which will examine new architectural possibilities for six global metropolises: Hong Kong, Istanbul, Lagos, Mumbai, New York and Rio De Janeiro. On October 15th 2013, X Bienal de Arquitetura de São Paulo opened at SESC Pompéia featuring NLÉ’s African Water Cities Project. The exhibition is open until December 1st. A couple of years ago, extreme floods in the commercial and residential areas of Lagos motivated architect and urbanist Kunlé Adeyemi to check out the city’s largest waterfront slum – Makoko – to see how its residents designed and managed their lives in the huge sprawl of communities scattered along the lagoon shoreline. Makoko, a Nigerian shantytown on the marshy waterfront of Lagos, is not exactly Venice, but there are marked similarities between the two. Both are built on wooden piles driven into saline mud and tidal ooze. The streets of both are famously full of water. Both were settled by fishing communities, Venice – officially – in AD 421, Makoko at some time in the 18th century. Their populations are of a similar size – 60,000 in Venice, around 80,000 in Makoko – although no one knows for certain. We are delighted to announce that NLÉ founder Kunlé Adeyemi has been selected as a Finalist for this year’s World Technology Award for DESIGN, presented in association with TIME, Fortune, CNN, and Science. Makoko Floating School featured at the London Festival of Architecture 2013. Atlas of the Unbuilt World, the British Council’s international exhibition for the London Festival of Architecture 2013, has opened at the Bartlett School of Architecture in central London. 60 architectural models gathered from across the world will be on display for visitors to investigate and compare. The exhibition is free and will be open until 27 June. In Makoko, a sprawling slum on the waterfront of Lagos, Nigeria, tens of thousands of people live in rickety wood houses teetering above the fetid lagoon. It’s an old fishing village on stilts, increasingly battered by floods from heavy rains and rising seas. Because the settlement was becoming dangerous, the government forcibly cleared part of it last year. 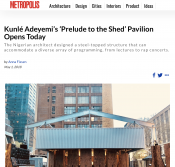 Kunle Adeyemi, a Nigerian architect, had a better idea…. The Afrofuture exposition (at the Milan Design Week) convened exports from the continent to consider the impact on African cities of some of the key questions from various disciplines including architecture, politics and technology…. One topic that provoked animated discussion was new designs coming from the continent. This followed the presentation by Kunlé Adeyemi, a young Nigerian architect practicing in Amsterdam and Lagos. He gave an illustrated talk on a school project he created for an aquatic village called Makoko in Lagos. Adeyemi belongs to a new and stimulating generation of African architects whose works are shaping the unfolding narrative of contemporary African architecture…. A three-storey floating school will soon be used in Makoko, a poverty stricken community on the flooded coastline of Nigeria’s capital. The new primary school in the Lagos slum is built on a foundation of 256 plastic drums. Powered by solar panels on the roof, it will be able to accommodate more than 100 students. Someday, whole floating cities could even migrate from one coastal area to another, giving urbanization mobility. NLÉ Architects are pioneering sustainable development and building a floating school in flood-prone Lagos. Led by Nigerian architect Kunle Adeyemi, the new multilevel school will address the community’s issues of poor waste management and land scarcity. 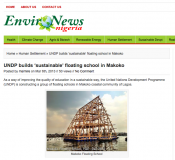 As a way of improving the quality of education in a sustainable way, the United Nations Development Programme (UNDP) is constructing a group of floating schools in Makoko coastal community of Lagos. MAKOKO, the coastal community in Lagos, hosted dignitaries and members of the international community last week, as a school, which was constructed on the Lagos Lagoon with an amazing input of Dutch marine architecture, was formally opened to the public. Showing welcome concern for the low standard of life of the inhabitants of Makoko coastal community of Lagos, the United Nations Development Programme (UNDP), has started the construction of special “floating schools” for children. WorldStage Newsonline– A new initiative aimed at assisting the clustered Makoko community area of Lagos, South-West Nigeria to adapt to the effect of climate change has resulted in the construction of a floating school, courtesy of NLE- an architectural firm with the support of United Nations Development Programme (UNDP), Africa Adaptation Programme and Heinrich Boll Stiftung. Designed for a flood-prone area of Nigeria, this school would keep students in school even after the heaviest rains. Architecture has always had the ability to shape how we live our lives and our relationship with the surrounding environment. For the residents of Makoko, Lagos in Nigeria, the threat of flooding is a part of their daily existence, with the July 2012 floods in Nigeria killing 363 people and displacing over 2 million residents. For the community of Makoko of Lagos, Nigeria life on the water is nothing new. Prone to flooding, residents have dealt with encroaching waters for generations by building houses on stilts and using canoes as their main source of transport. Now, with the threat of sea level rise from climate change, and developers who want to tear the community down, Makoko is in a state of uncertainty. Design and urbanism practice NLÉ, led by Nigerian architect Kunlé Adeyemi, is building a new multilevel school in Makoko – a region of Nigeria’s most populous city, Lagos. While that doesn’t sound too unusual, the difference here is that in an effort to address the issues of land scarcity and poor waste management that affect the flood-prone area, this school is being built on floating platforms. Join us as we engage with a panel of experts constituting the most daring and innovative thinkers on African cities and societies, in a discussion on contemporary solutions to a new century’s challenges and opportunities. Lagos is Africa’s largest city. Next to the sea, it experiences regular flooding from tropical rains, and water is a way of life for many residents, particularly those in Makoko. People living in this fishing community have built their homes on the water and trade on it. But the area has just one primary school. Nigerian architect Kunle Adeyemi is hoping to build another – one that floats on the water and is powered by solar panels. The laudation for the winning entry Butaro Hospital by MASS DESIGN was given by Kunlé Adeyemi, founder of NLÉ Architects, Amsterdam and a member of the Zumtobel 2012 Award jury. Nigeria architect, designer and ‘urbanist’, Kunle Adeyemi of NLÉ in partnership with the Heinrich Boell Stiftung, has proposed plans to build a three-story school out of 16 floating platforms lashed together, capable of holding 100 students and teachers, in the waterfront slum of Makoko, area of Yaba, Lagos. • Featured architects: Kunlé Adeyemi/NLE, Atelier Bow-Wow, Jürgen Mayer H, Normal Architecture Office (NAO), Adriaan Geuze/West 8, Ron Witte/WW, UrbanLab, Sean Lally/Weathers, and OMA. Their canoes drift on the water as piles of rubbish float outside their shacks. Shabby shacks on stilts, floating waste and rickety boats fill the expanse of murky water. But for the thousands of poor people forced to live in Nigeria’s infamous Makoko slum in Lagos, this is their home. In the waterfront slum of Makoko in Nigeria’s largest city where shacks stand above the murky, fetid water on stilts of cast-aside lumber, an architect thinks the neighborhood should float. Respite appears to be on the way for sacked residents of Makoko area of Yaba, as an architect, Mr. Kunle Adeyemi, Thursday said he had concluded plans to build a three-story school out of the 16 floating platforms lashed together to enhance the educational needs of the people of the area. Kunlé Adeyemi is appointed as 2011 Callison Distinguished Visiting Lecturer of the University of Washington, teaching and researching ‘The Modern City in the Age of Globalization’ in Chandigarh – India’s first planned modernist city. On Saturday, June 3, 2006 the Solomon R. Guggenheim Museum and Oldcastle Glass will co-host a one-day symposium at the museum entitled “Contamination: Impure Architecture” on opening day of the special exhibition Zaha Hadid, on view at the Guggenheim through October 25, 2006 – bringing together leading architectural theorists and practitioners to discuss the theoretical notion of contamination and architecture. The following roster of international architects and designers are participating: Kunlé Adeyemi, Elizabeth Diller, Zaha Hadid, Sanford Kwinter, Greg Lynn, Gabriele Mastrigli, Alex McDowell, Farshid Moussavi, Patrik Schumacher and Bernard Tschumi. 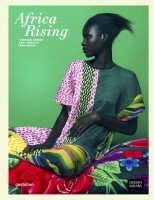 Kunlé Adeyemi’s article ‘Urban Crawl’ was published in the Log Journal 10 of Summer/Fall 2007.